The answer to what this trip was about and what it had to offer, came as an answer to a question I got asked somewhere halfway my trip. A woman, sitting in the lounge of a fancy hotel we found some shelter in, during rough weather, told me she could never do what I was doing. Consequently, she asks me: how do you do it? And I told her – without hesitation – that I felt a deep trust that we would meet the right people at the right moment. And thus, it was, exactly. We met the right people at the right moment and traveled the country without car, without advanced reservations for accommodation, trains or ferries, in the busiest month of the year. All it took was a leap of faith. A deep trust that all would be well. And: that I’m part of a web of life, a web of relations, that deep down just wants to collaborate to make things work. As we walk of the ferry, and step unto British territory, I make a crucial decision. Instead of taking one of the three organized buses to the train station, which are handily located just outside the ferry’s exit, I write down ‘West-of-Scotland (maybe Skye)’ on a white sheet of paper, that I happened to carry with me. Before I know it, a lovely German couple offers to take us to Jedburgh, which has a beautiful abbey that we get to visit. From there we end up in Sheryl’s cottage. A woman we meet going after a cup of coffee. On our first night abroad, I’m in Sheryl’s yoga class at some local hospital where her husband works. Driekus and Sheryl’s dog, are with her husband, who takes the two of them out on a walk while we practice sitting in Lotus. Next day, on the train in direction north to Pitlochry, I meet a local man who lives down the street from my great-grandmothers’ clan-museum. The only planned visit I had intended on, to find out more about my Scottish roots. The man tells me Pitlochry is horrible (too touristy) and directs us to Blair-Athol, where we arrive just in time to visit an impressive castle. In the morning, we bring our luggage to the local water mill which serves as a bakery, for the campsite has no storage facility. When we come back, in the afternoon, to pick up our things, I meet Trish and her daughter’s dog. She starts to talk to me and I tell her of our great walk and visit to falls of Bruar. She tells me she’s dogsitting her daughter’s dog. She was hoping Driekus would be a good playmate. Trish offers us a ride to Kingussie and we end up staying at her cottage. We head out on some amazing walks with the dogs in rainy weather, with the sun peeping through now and then. We pick berries and I learn to spot chanterelles and I feel absolutely blissed to eat those handpicked chanterelles as a starter. As the dogs wear down and my shoes are put to dry, we talk about all those things that are also written about in the book I carry around, ‘if Women rose Rooted’. A book that, coincidentally talks about all the places I’m visiting in Scotland, without being on a plan. A book that arrived on my doorstep the day I leave, because my friend Maria Kolossa thought I might like it. The journey continues. The Inverness bus to Ullapool is full, so we take a train in the same direction, to the little town of Garve. As we arrive in Garve and rain pours down, I ask two men at a fish and chips shed, about the road in front. Is this the road to Ullapool? They agree and offer us a ride. They end up taking us right to the pier where the ferry lands, and we make it on to the 19 o’clock ferry. When we land ashore on Lewis, a woman and her husband see us wandering around and offer to take us by car to the campsite just 3 miles north of town. ‘It’s our friends’ campsite, they state, and we don’t mind saying hello! It’s such a great place, you’ll love it!’ The couple and their daughter, make sure we are well received. The next morning, I feel like crossing the island to see the Standing Stones at Callanish. It’s a Sunday and in the highly religious Lewis, there are no busses out. No taxi’s. No shops open. We start walking and must wait almost 45 minutes before a car takes us. Knowing that 23 miles is too far to walk, not only for an 8-months old dog. Two women, one of them from Lewis, pick us up. They’re also visiting the standing stones and the local woman shares what she knows about the stones. She also points out the wise woman sleeping in the distance. A beautiful hill view that is later described in this book I’m reading throughout the journey, “If women rose rooted”. The women take off and leave us at the stones. Another woman connects with Driekus: ‘ah, you’re the beautiful dog I saw on the ferry. You’re so lovely! To me: I think you’re staying at the same campsite! Are you also visiting the stones? What are you doing next?’ Tina and her family end up taking us along to see other sites. A ruined black house. An impressive tower and a very nice beach with beautiful stones in all sorts of colors. They hand us sandwiches and tea. Which is nice, for even the little shops at tourist sites are closed and I only brought dog food and some chocolate. In the evening, Tina invites us in for a tea. And we end up having dinner together. I share the chanterelles I picked with Trish on our morning walk. They still taste amazing. Next morning, we’re off. I tell Tina and her family we’ll try to do a three day walk from Tarbert, North Harris, to Leverburgh, following the Hebridean Way. They tell me they’re also heading that way, so we end up going together, after a quick visit to the lovely town of Stornaway. In Tarbert, I find no storage facility at the ferry, tourist information or local hostel. Quite out of options and slightly worried, I speak to an elderly man in the street and ask him if he might have a bright idea. I want to start walking but not with all that luggage. He tells me I can leave the excess luggage right there in his shed. It’s always open. ‘You can pick it up when you want’. I’m around most of the time, doing some work at the house’. Happily, I reorganize my gear to walk with the bare essential, and then Tina’s husband pops his head around the corner: ‘will you be alright now?’ ‘Yes, I will! Thank you so much! !’ And of they go. The boys wave from the car as they drive by. Now it’s just me, the dog and the hills. And the bog of course. And some wet socks every now and then. We camp out wild on a not too wet spot. Next day, out from the middle of nowhere we end up at a road in a bay with a community Café (called ‘Bay’s Café’), where two lovely ladies serve us some toast, coffee and pie. Later that day, after another few hours of bog, we stop at a gallery and get offered a cup of tea. 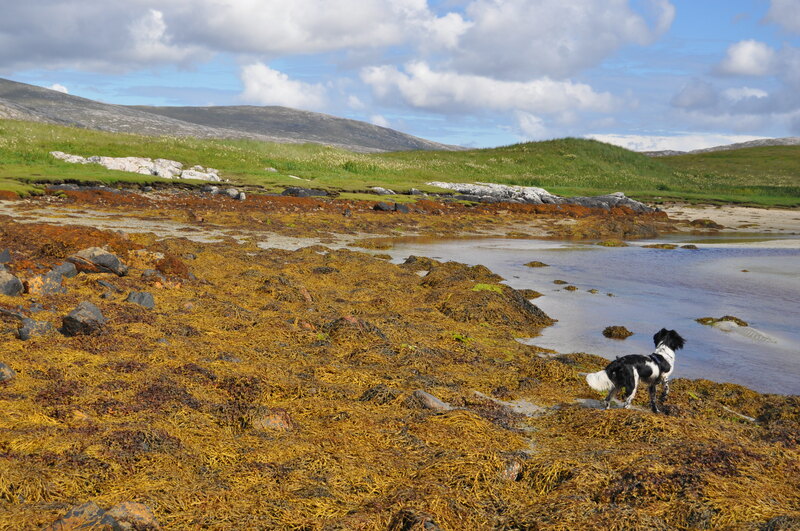 That day we end at Holgabost campsite and it is the best day of the trip, weather-wise. The views are stunning. White sandy beaches, blue ocean, green grass. The colors speak to my heart. I can’t stop taking photographs and love the sight of Driekus going after birds. Luckily, he doesn’t catch them. And the chicken he does get a hold of in someone’s garden, lives on just missing a few feathers. At Holgabost campsite we find a spot near a tiny river. And that’s where Driekus makes some new friends. Racing through the river, up the sand dunes, he seems unstoppable. The next day, we must head out for the Hebridean walk way without the detailed descriptions of the tourist office, that we had for the first stretch. That doesn’t feel right and I decide to stop the first car that comes along to ask if they might know more about where the path continues. The car I stop happens to be the same man that I asked the day before, when he didn’t know the answer to the same question. I’m ready to give up, but he says: ‘Wait. I know now. I asked at my B&B last night and it turns out the walkway goes right about the land of the B&B. Just turn left here and ask the man of the B&B, he’ll show you where to go’. And so, the owner of the B&B explains and shows us to look out for the white poles. Since there hadn’t been many poles on the first two days of walking, I don’t trust him at first. But he’s confident enough: ‘from every white pole, you’ll see the next one, just look ahead’. So, of we went. Through the boggiest land one could imagine. No tracks. Just poles. And holes. At some point, we end up in the middle of an amazing herd of Highland Cows. Such impressive animals. They decide to come right up close. Time to feel nervous. But I did not feel any aggression. Just curiosity. When we finally arrive in Leversburgh, the time is 17.40. We’ve got 20 minutes till the local shop closes and we get some luxury supplies. That night Driekus and I eat smoked mackerel right next to the local creek, where we pitch our tent. When I ask one of the neighbors if we can drink the water, he explains that the white foam is a normal occurrence when logs and water streams from up the mountain come together. He also shares his life story and tells me that his loved one runs the big blue house right in the village. She’d love to see us in the morning, if we’re still around. Unfortunately, we aren’t. We catch an early bus and end up picking up the luggage from the shed in Tarbert. In the ferry from Tarbert to Uig on Skye, I find myself, coincidentally, sitting next to the man who offered us to put the excess luggage in the shed. He ends up taking us with him all the way to Fort William, from where we catch the bus to Oban. A bus for which we must wait only five minutes to depart. And so, the flow of the trip is clear: whenever I would truly connect with what was there, when I would see reality as it was, and then determine my focus, I created my own reality. I would connect to the conditions I met in a way that fitted me. And it would feel like one big flow. And a lot of serendipity. A relative, joyful game of life. It’s not until we reach the island of Islay, after a wonderful stay in Crumble Cottage on Oronsay, with lovely neighbors and amazing nights, dancing Caleigh’s in the local village hall, that the nice flow of the trip is broken. The weather that Wednesday is awfully bad. The ferry delayed. And as we approach Port Askaig I wonder where we’ll sleep. It’s raining and exceptionally dark for the time of the night. A lady that speaks to us with an 8-weeks old puppy on her arms, doesn’t offer us a ride, though she’s heading in the direction of our liking. Part of me understands. She’s worried about the puppy. Another dog might stress him out too much and it’s already a big journey. But still, I’m disappointed. When we walk up the ferry and enter the little shop that is still open, the man behinds the counter responds: ‘I thought you were going to ask about camping’. Well, I answered. That could have been my second question. And before I know it, he offers us to camp out in his garden. All seems well as the rain stops when I set up the tent. But the midges start eating me alive and I go crazy. I run to the bar of the hotel, also owned by the man of the shop, and sit down for a cider. When I go back to the tent in pitch dark, without a torch, misfortune happens. The garden is two-levelled and I accidentally fall of a sturdy wall and badly cut my hand. The victim in me takes over and I cry as a baby, wanting my mother. Feeling lonely and stupid for not being in my usual flow, which would have made me think of a torch. I wasn’t fully accepting the rain, the darkness and the ‘no of the woman’. Nor the midges, that were driving me crazy. In this fighting mode, accidents happen. When I calm down, the hotel owners clean my hand but don’t offer me a room, which is not so surprising. They don’t want dogs in their room and I’m not in a good mood. I don’t connect with them well. They don’t feel sorry for me. When I sense their mode, I feel like they think I might blame them for the accident, due to the lack of light in their garden. I can’t sleep for hours because of the pain. Luckily enough, I finally fall asleep and Driekus let’s me sleep in till 10.30. He’s never done that and I feel quite okay in the morning. Off we head to Bowmore, where a hospital can be found. A friendly doctor and nurse clean the wound thoroughly, giving me antibiotics. Other nurses sneak out every now and then to give Driekus treats and calm him down. He’s sitting outside, howling for me to come back and hoping the rain will stop. Later that afternoon, with the help of the Tourist Information, we have a great indoor lunch at a dog-friendly restaurant and enter a school bus to the campsite in Port Charlotte. At night, misfortune happens again, but in a better way. I can handle it gracefully. In a big storm one of the tent poles snaps, but the tent survives. We can stay in and stay dry. Next morning, in a random conversation, a Dutch couple shares their camping-knowledge. Apparently, almost every tent kit has a spare part kit, to fix broken poles. Nice! I had already wondered what that spare tube was for. So, off we go, light at heart, hitchhiking to get to Port Ellen. The third car that passes, is a friendly couple we met at the campsite, that asks if we’re also trying to get to the ferry at Port Ellen. And so, we arrive on time for the midday ferry in Port Ellen and arrive in Kennacraig around 15.30. From there, we take a Westcoach bus to Loch Lomond. Unfortunately, dogs are not allowed on those buses, unless small and put in hard encasings. Fortunately, I carry with me a big brown shopping bag, completely out of proportion, but it fits Driekus right in. The driver shows heart and allows us in, once Driekus is put in the bag. We arrive at Luss and find a camping spot right near the lake. We have dinner in the lobby of a fancy hotel down the beach, after we find the local village restaurant that accepts dogs, closes at 20.15. The friendly receptionist of the hotel helps us find the train times to Newcastle, so we decide to stay another night and head back to Newcastle on Sunday. On Saturday, we visit Cony Hill, traveling by waterbus and then hiking up the hill. On our way back, passing through Alexandria, we meet Michael in a pub, who shares all about the industrial misfortunes of the ugly town of Alexandria. The whole pub watches Driekus, while I run to the ATM to fetch my phone, which I thought I had left lying around. Instead, the phone was in my bag, and happily, yet a bit embarrassed, I finish my cider, in conversation with Michael. As we head back to Newcastle upon Thyne on Sunday, and find the trains delayed from Edinburgh because of ‘an accident with a person’, a friendly man allows us to board a later train that departs earlier and gets us there on time. And then: when I stand on deck of the ferry, the Dutch father and daughter that I met by chance on Colonsay, just before crossing to Oronsay by foot with low tight, come walking up to me with my red rucksack. When I asked them to carry a bit of my luggage, they told me they were on the Sunday ferry. As was I. What a perfect coincidence. And now again. On deck, they found me watching the harbor slide by, before I could make a big fuzz out of trying to find them. Now, the morale of this nice little holiday story is two-fold. First, traveling lighter is worth it. Not only in terms of kilos of luggage, but also in terms of the amount of planning. Working with rather than against the natural flow of things, the flow of life, saves energy. Not only in terms of fuel costs, but also when it comes to my own energy. It’s the path of least of resistance. It simply works. And thereby, its more sustainable. In all sorts of ways. Second, it requires faith to keep traveling light. To not change the relative game into an absolute game*. To not fight with reality and pay the price for it. Faith in the web of life that we’re part of. Some relationships might seem broken, but most are still there. Ready to be uncovered. To be spoken to. To be activated. In words of systems theory, the way I traveled would be called traveling by ‘dancing with the system’, rather than by trying to control it. If your background brings you a vocabulary that is more related to systemic work, or constellations, I would argue that the way I traveled, is in an autopoietic way. Which means that I wasn’t following my personal consciousness and going after a certain plan. I was mostly not following the systems I’m part of, for persons that are close to me, told me in advance I’d be crazy not to hire a car. Or they’d say: you’ll sleep in bunk houses and under cover. Not in a tent. Scotland is too wet. Instead, I think I was following where life was asking me to go. Also called, the evolutionary flow. Since I added my own ‘zest’ to it, my own creativity, it seems I became autopoietic*. Or in Deepak Chopra’s words: ‘a magician’ of my own reality. Now, let’s make myself small again – shall I not?! Now, all of this may sound highly pretentious and I can feel my tendency to end with a few notes to downplay the whole thing. About things that didn’t happen, but would have been nice. About the days I spend behind my computer following plans I had had before the trip to at least get out some invitations for programs I’m involved in and get ahead with my newsletter. But it doesn’t feel like that would be justified. I liked the work I got done on rainy moments. And downplaying it like this, would come from this tendency I have to make myself smaller after something went quite well, in order not to feel guilty. A pattern that many of us are trapped in, and I’m not going to fall for it. So here it is, the magical story of my travels with Driekus in Scotland. Dancing with systems. Following the flow of life. To end a bit pragmatic. Now that I’m back, let’s see how my planned future coped with my three-week absence. And: let’s see if I can keep following the flow of life, in real, working life. Let’s hope I’ll have the faith to go forward just the same. Dancing with systems. PS – telling my mother the stories of my trip – she was quick to conclude that of course, Driekus played a crucial role in this adventure. Through him I connected much more easily with people. He made the connections for me. That is a beautiful role that companion animals can play. And I thank him for it, with all my heart. He’s my new favorite holiday buddy! Together, we made this a trip not easy to forget! *For more about the theory of the absolute versus the relative game, read the book review of the book ‘Life is a game’ by Erik van Praag and Jan Paul van Soest (in Dutch). Or read this blogpost.